Do-It-Yourself Water Filtration Products from Doulton Ceramic Filters, Rainshower Shower Filters, Kx Carbon Block Filters, WaterWise, Genesis Distiller, British Berkefeld, Berkey, Filmtec Reverse Osmosis Membranes, Katadyn, and other fine water filters. 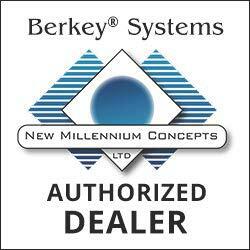 We have "No Plumber Required" Countertop Water filters, Under Counter water filters, and Gravity feed water filters all for the do it yourselfer Note: Some Berkey Products are not yet available for shipment to California and Iowa PRICES SUBJECT TO CHANGE WITHOUT NOTICE. © 1996 - 2018 H2ofilters.com All Rights reserved.